Spectacular ocean view home in Arch Cape, across a quiet private residential street from the beach and beach access. Next house behind ocean front. Much detail has been put into decorating and designing 'Ocean Landing' to make it an unforgettable experience. Arch Cape has 2 mile stretch of secuded beach with lots of tide pools, beachcombing, kite-flying, and bon-fires at sunset. You are close enough to enjoy the fun, restaurants, and shopping in Cannon Beach and still have your own quiet beach. 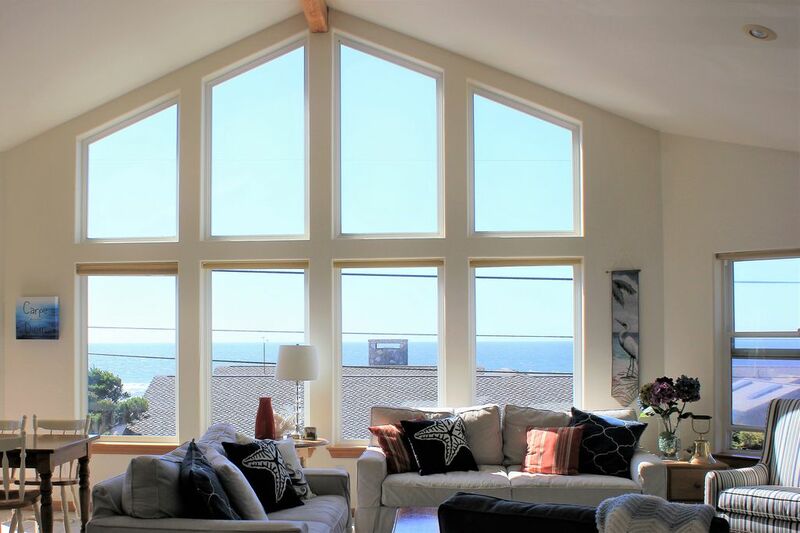 Our coastal house, 'Ocean Landing', has a 20 foot high wall of windows facing the ocean and beach. You can relax in the beautifully appointed , yet cozy second story living room with your family and friends and watch the ocean waves roll in.......or head out the door onto the deck off the living area where you can make dinner on the BBQ and sip a glass of wine or read your favorite book. The living/dining, kitchen, bedroom with video game area and bathroom with skylight are all on the upper level and provide stunning views of the ocean, Castle Rock and forest/mountains. The kids will love grabbing some of the many beach toys provided and building sancastles on the beach, collecting shells, exploring tide pools, or renting beach bikes in nearby Cannon Beach. They can also enjoy an Xbox 360 Kinect video game or other family games in the evening in a game area next to the living room. We provide a library of DVDs, books, family games, cards, puzzles, and video games. Have a bon-fire on the beach... we provide the beach chairs, flashlight, picnic blanket, picnic basket and marshmellow sticks! Our beach house features all the comforts of home, such as Flat screen TVs, wi-fi 5-G internet access, IPOD docking and CD player, video game player, hairdryers, well stocked kitchen with cookware, dishes, utensils, spices, blender, coffee maker, coffee grinder, microwave, washer, dryer, dishwasher and much more. We also have a high chair, security gate and play-pen for the little ones. It is truly a 'home away from home'. The living area is spacious and tastefully decorated and the beds are comfortable and feature high quality linen for your comfort. The laundry room is upstairs and has a washer/dryer, iron and ironing board. The house is immaculately cleaned before you arrive. We supply all linens, endless towels, table linen, paper goods, soap, cleaning supplies, basic spices, first aid kit, flashlight, alarm clocks, and much more. Please, no smoking, no pets. Check-in 4:00 pm, Check-out 11:00 am. Mike and Deb Pierce live in Henderson, Nevada and love to head for the spectacular Oregon coast to get away from the desert heat. We first came to Arch Cape for a family reunion. We fell in love with the natural beauty of the mountains, sea cliffs, expansive beaches and interesting rock formations. Arch Cape itself is a little slice of heaven. It is 4 miles south of the hussle amd bussle of Cannon Beach, yet still convenient to the interesting stores and restaurants. Arch Cape has more then 2 miles of walking beach and is very private and secluded. You have the feel that it is your provate beach. At low tide you can explore the tide pools, walk to Hug Point waterfalls and around the famous road in the rocks and then beyond to the most beautiful beach on the Oregon coast, Arcadia State Park. and for the really fit...a walk all the way to Haystack Rock in Cannon Beach. The kids enjoy picking up sand dollars and other treasures along the way. At dusk you will often find your neighbors at the beach gathered around a bon fire to watch the sunset and enjoy the fresh evening breeze from the ocean. Ocean Landing is a dream house for us. The wall of windows overlooking the ocean and Arch Cape beach and rock formations is enough to lift the heaviest heart. We never feel more relaxed and alive then when we are at our special beach house. The house is spacious even for a large family or gathering of friends. We enjoy making dinner in the kitchen that is light and airy, with windows that overlook the ocean. Sitting on the west facing deck with a glass of wine is another place you can often find us at sunset!! 2 bathrooms with views of the woods. Bluebirds feed out the window. the beach is 150 feet away and has a private access to beach 3 houses to the north. The beach access is only short steps away and the ocean waves and sounds can be seen and heard from the large deck and great room. new large load washing machine. Detergent supplied. Gas fireplace for convenient use. Please no parking on the street. Property can park 6 cars. living room with wall of oversized windows with panoramic view of ocean, comfortable setting, fireplace, HD TV and I-POD music player, DVDs for entertainment and games. plenty of dishes and utensils for a large group. Blue Ray in front room and DVD player in master bedroom. Sorry, Scrabble, Apples to Apples, jig-saw puzzles, cards, poker chips, assorted other games. It was a very comfortable family oriented home. We enjoyed it very much. We absolutely loved this home. It was so exceptionally clean and we really appreciated that. There was an abundance of kitchen items which was very helpful. Overall we had a wonderful stay. Great location! Beautiful HOME away from home... Thank you! This was our second time for a family get together. Everything was clean and organized with everything needed for a good time and comfortable accommodations. The home is absolutely delightful and comfy. We felt like we were at home right away. Beautiful scenery, comfortable beds, plenty of amenities. This has definitely been one of my best vacations ever. Thanks so much. Our family had a fabulous week at Ocean Landing in Arch Cape from the youngest, 4, to the oldest, 90. The easy access to the beach made it available for all to enjoy. The house was spacious and we loved the view. Having a deck to relax in the open air and barbecue on fit our lifestyle. We could have used more toys and games for inside the house, but the sand toys worked out well. None of the x-box games were appropriate for our age group of 4-8 which disappointed the 8 year olds. Overall, we had a fantastic time and will have some wonderful memories to last a lifetime! Kathy, So glad you and your family had a great time. The deck overlooking the ocean is a favorite spot for everyone. We do have 2 X-Box games that are rated for everyone, Kinect Adventures and Kinect sports. We have the Kinect sensor necessary for these games. We also have a lot of board games such as Scrabble, Apples to Apples, Pictionary, Dominos, Skip-bo, puzzles and lots of cards. During the summer season, June 15 to Sept 15, the minimum stay is 7 days. The weekly price for the offseason months reflects a 7th night free. Cancellation of less then 90 days prior to arrival shall forfeit the entire deposit unless the owners are able to re-rent the property.